Their cricket knowledge was above average and I decided to keep a low profile, only chipping in with the occasional remark. The discussion quickly escalated past the top six batsmen (“yeah, those playing now are the best we’ve got and we just have to hope for the best”), the wicketkeeper-batsman position (“Quinton de Kock on his day is the best in the world”) and the bowlers (“we’ll always be all right in this department”) to the real weak spot: the all-rounder. The opinion on Andile Phehlukwayo was divided but he probably got the benefit of the doubt from my new friends. However, it was unfathomable to them that on the evidence of recent performances Wiaan Mulder and Dwaine Pretorius could be regarded by the selectors as better options than Chris Morris. Or even Robbie Frylinck and Vernon Philander. The discussion then got really interesting when they started to compare Phehlukwayo, Mulder and Pretorius to other all-rounders. Firstly, to South Africans of yesteryear: Clive Rice, Mike Procter and, more recently, Brian McMillan, Lance Klusener and Shaun Pollock. Secondly, to their current counterparts from other countries: My new friends mentioned Ben Stokes, Moeen Ali and Hardik Pandya. It was at about this point of the discussion that I blew my cover, trying to come up for Mulder. When I explained his excellent youth career and the instant impact he had made in franchise cricket, they sort of accepted his selection. As for Pretorius, they couldn’t understand what’s happened to his batting (“he used to hit a long ball” one said). Driving home I realised my new friends – armchair cricket fans – are spot-on. Phehlukwayo, Mulder and Pretorius are not (even potentially) in the same class as some of the great all-rounders this country has produced. Add to Stokes, Ali and Pandya other all-rounders who will also be at the World Cup, like Kedar Jadhav (never mind that he’ll be 34 at the time), Marcus Stoinis, Colin Munro, Jason Holder and Shadab Khan to name a few, and again the three Protea incumbents compare poorly. And finally, will Phehlukwayo, Mulder and Pretorius really be better than my friends’ three alternatives of Morris, Frylinck and Philander? I don’t think so, at least not in 2019. 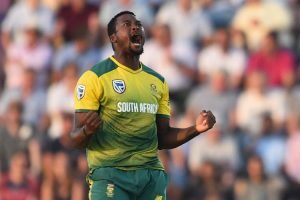 Judging by the predictions of three armchair cricket fans, if South Africa has any chance of bringing home the World Cup, the frontline batsmen and bowlers will have to do the job. « Where are South Africa in terms of the 2019 World Cup?